April 9, 2018, 2:18 p.m.
Its heart is in the right place, and the decline of local news really is a big threat to democratic governance. But the dataset it uses is far, far too sloppy. 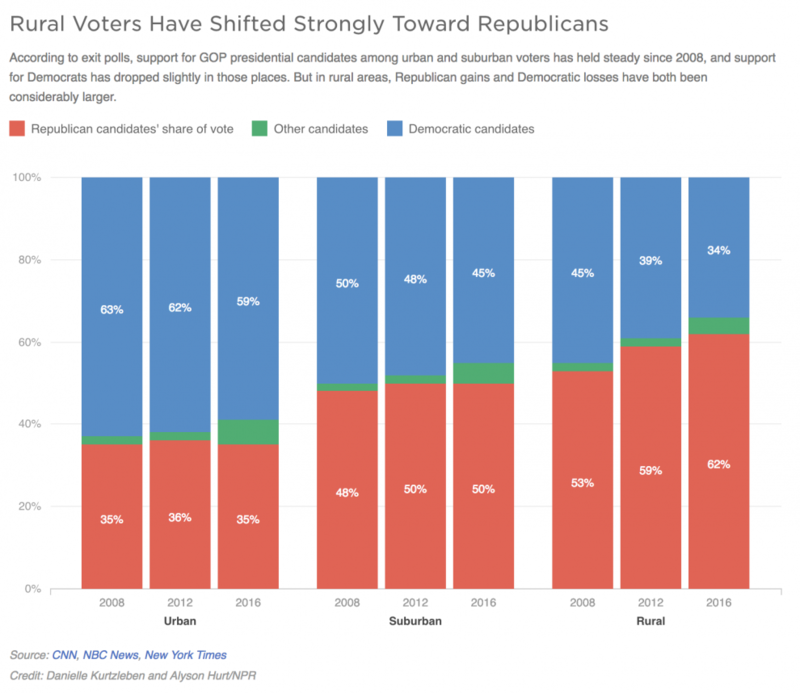 By Joshua Benton @jbenton April 9, 2018, 2:18 p.m.
An extensive review of subscription data and election results shows that Trump outperformed the previous Republican nominee, Mitt Romney, in counties with the lowest numbers of news subscribers, but didn’t do nearly as well in areas with heavier circulation. I have a lot of sympathy for those who argue that the decline of local newspapers has led to a decline in government accountability, political engagement, and a host of other democratic ills. There’s been a fair amount of academic research supporting the claim; I’ve always liked this 2009 Princeton study that used a nifty natural experiment to show that after the closure of the Cincinnati Post in 2007, “fewer candidates ran for municipal office in the suburbs most reliant on the Post, incumbents became more likely to win re-election, and voter turnout fell.” I’ve long written about the platform-worsened decline of local news and the alarming concentration of our journalistic resources in New York and Washington. But this study doesn’t really show what people are claiming it does. The underlying argument might be true, but the data the authors are using doesn’t prove their case. Here are a few of the issues I have with it. The study’s definition of a “news desert” is awfully strained. “News desert” is a term without a universally agreed-upon definition — but there are a number of problems with the one Politico uses. What about during the 2016 election — maybe tons of people were getting their Trump and Clinton news from the local daily? Nope — when asked what was their main source of news about the 2016 election, only 3 percent said it was a local newspaper. News deserts are a real thing — but you can’t just decide that a single (and extremely flawed, as we’ll see in a bit) data point about America’s fourth-most-popular form of media is the be-all and end-all. Come on. Does anyone think that the job of “independent media” checking Trump’s claims really fell in any significant way to local newspapers? It was up to The Poughkeepsie Journal to fact-check him? If this was a study about local congressional or legislative races, it might make sense to look at local media. But the presidential race has been the dominant turf of national media for literally decades. 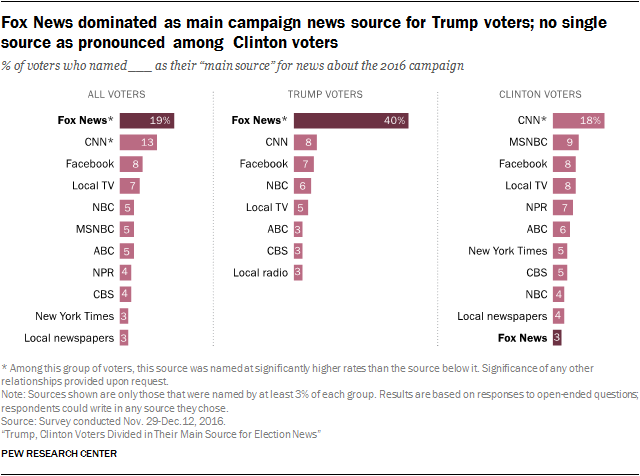 In that Pew study, only 11 percent of Americans cited any local news source — TV, radio, or newspapers — as their main source of election news. Politico’s analysis shows how [Trump] succeeded in avoiding mainstream outlets, and turned that into a winning strategy: Voters in so-called news deserts — places with minimal newspaper subscriptions, print or online — went for him in higher-than-expected numbers. It is just ahistorical to say Trump’s campaign “succeeded in avoiding mainstream outlets.” Candidate Trump gave tons of interviews throughout the primaries! And when he scaled those back in the general, one of his strategic shifts was shifting from national to local media! Whatever perfectly legitimate criticisms you want to make about how the media covered Trump, to say Trump “avoided” coverage in mainstream outlets is just…wrong. Giving two examples of outliers is not a particularly strong way to argue that we’re not just seeing rural/urban — but even these two outlier counties they mention are unusual choices. Both Yuma and Robeson counties are majority-minority counties that that also voted for Trump. Weird, right? Yuma County is 60 percent Hispanic and smack dab on the U.S.–Mexico border. The fact that Trump had, well, plenty of things to say about Hispanics and the U.S.–Mexico border seems like a more likely factor in any anti-Trump swing than newspaper subscriptions. Then take Robeson County in North Carolina. Only 29 percent of the county is non-Hispanic white; 38 percent are Native American, and another 25 percent are African-American. But note the huge exception thrown: one of the county’s papers, the six-times-a-week Robesonian, doesn’t report its circulation to the AAM. Maybe the reason the county’s subscription totals are low is that, as far as I can tell, The Robesonian is the only daily newspaper in the county. If you ignore the only newspaper in town, then yes, newspaper subscription numbers do look low! I don’t know how many subscribers The Robesonian has today, but as of 2009, it claimed a circulation of 14,000. 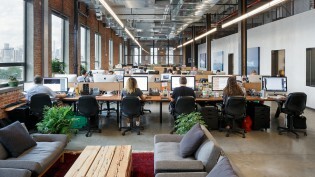 (It also says it reaches 60,000 people a day between print and online.) Robeson County had about 44,000 households in the 2010 census. So even if that 14,000 number has dropped substantially, Robeson County is far from a news desert. That Robeson fuzziness leads me to the final and most significant problem with Politico’s analysis. I could imagine being convinced I’m wrong about some of these other complaints — but this one lies at the root of the piece. Politico relies on extremely incomplete and sloppy data. You may remember the Alliance for Audited Media by its previous name, the Audit Bureau of Circulations. Newspapers hire AAM to audit their circulation numbers — how many papers they publish and sell — so that advertisers can be more confident that the ads they buy will really reach as many eyeballs as the newspaper claims. All of Politico’s newspaper numbers come from AAM; if there’s a problem with AAM data, there’s a big problem with the analysis that relies on it. Price County has virtually no paid local-news circulation? That would be breaking news to the Price County Review, the weekly newspaper there, which has in various forms existed since 1884. It’s part of a small chain of northwest Wisconsin papers, which is in turn owned by Adams Publishing Group, which owns a bunch of weeklies, mostly in the Upper Midwest. I don’t know much about the Review, which charges $50 a year for a subscription. But it says that its print edition reaches 3,500 households. Price County only has about 6,500 households in total. Maybe some of those papers go out of county, or maybe their numbers are screwy somehow. But a paid print newspaper reaching something like half of a county’s households is no one’s definition of a news desert! It’s just that the Price County Review, like many hundreds of American newspapers, doesn’t bother to give AAM their circulation data anymore. That is just not true. “Almost all” large dailies report to AAM. But most small dailies don’t. And those small dailies are mostly in Trump territory. It’s hard to pin down exactly how many daily newspapers there are in the United States, but the number is generally agreed to be somewhere around 1,300. (In 2014, the main newspaper trade association reported there were 1,331 American dailies; the number’s dropped a bit since then, but not by much. Editor & Publisher’s Databook currently lists 1,232 daily papers.) But AAM, according to its Media Intelligence Center database, only tracks circulation data for 668 of them. So AAM’s data is missing roughly half of American daily newspapers. How about weekly papers, so important in smaller towns? Their trade group, the National Newspaper Association, says there are over 7,000 of those, about 44 percent of which offer paid subscriptions and aren’t just free giveaways. The NNA itself reports having 2,200 member papers. So how many American weekly newspapers does AAM have data on? 428. So who are these hundreds of missing daily newspapers and thousands of missing weekly newspapers located? It ain’t The Boston Globe. These are overwhelmingly small-town and rural papers. These are papers that don’t do much business with national advertisers, the main folks who like having audited circ numbers, and so they don’t think paying AAM to say their numbers are real is worthwhile. And what do we know about small towns and rural communities? They went for Trump by a wide margin. That’s a huge gaping hole in this analysis. It’s not just Price County, Wisconsin and Roberson County, North Carolina that have badly wrong data. (Though, hey, that’s half of all the counties mentioned in the piece.) It’s hundreds and hundreds of counties. That omission makes subscription numbers in rural, pro-Trump counties look artificially low. Again: I am absolutely willing to believe (and think there is at least pretty convincing evidence) that the decline of local newspapers has reduced engagement in the political process. I’d be very open to the idea that there is a statistical connection between the decline of local news sources and voting for Trump. (There’s plenty of evidence that Trump did extremely well among what political scientists call “low-information voters,” and there is a clear connection between low-information status and media consumption patterns.) 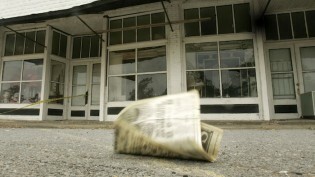 The decline of local media is arguably the largest problem journalism faces today. But this study doesn’t show what it’s claiming to show. 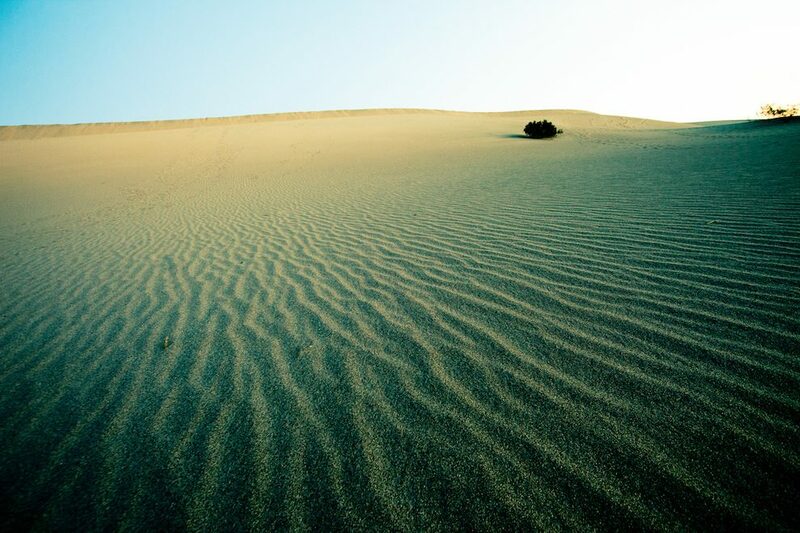 Photo of a California desert by Thomas Hawk used under a Creative Commons license. POSTED April 9, 2018, 2:18 p.m.
Benton, Joshua. "That Politico article on “news deserts” doesn’t really show what it claims to show." Nieman Journalism Lab. Nieman Foundation for Journalism at Harvard, 9 Apr. 2018. Web. 23 Apr. 2019. Benton, Joshua. "That Politico article on “news deserts” doesn’t really show what it claims to show." Nieman Journalism Lab. Last modified April 9, 2018. Accessed April 23, 2019. https://www.niemanlab.org/2018/04/that-politico-article-on-news-deserts-doesnt-really-show-what-it-claims-to-show/.